McAully Smash Repairs undertakes all forms of automotive crash repair works to a wide variety of vehicles. These works are of a consistently high standard as is required by all the leading insurance companies, automotive OEM and private owners who seek the finest in quality workmanship. McAully’s staff are fully qualified to restore your damaged vehicle to its original pristine condition in the best possible time frame. All repairs performed by McAully Smash Repairs staff come with a lifetime guarantee. The high quality of our staff is complimented by the latest available technologies. These technologies include our Glasurit environmentally friendly water borne paint system. We have proudly used and recommended Glasurit paints for the past 31 years www.glasurit.com.au/ . Where possible we pride ourselves on using the latest in cutting edge technology and environmentally friendly products. Should you require a quote on your vehicle repairs you can either submit your requirements using the “On-Line Quote” form easily located on this website. Alternately you can call our office on (07) 3281 3344 and arrange a time with our estimating team to bring your vehicle in for inspection. When you bring your vehicle in please remember to have all your relevant insurance information with you as this will assist our staff in providing you with a competitive and affordable quotation. Once our Estimators have completed their review of your vehicle’s required repairs you will be allocated a repair date before leaving. Once the quotation has been prepared by our team it will be sent directly to your insurance company for approval. You will only need to attend again to drop your vehicle off on the allocated repair date and then for the final time when you have been advised that it is ready for collection by our staff. Should you wish to wait for your quote this is also an option for you and to cater for this we provide a modern, fully air-conditioned customer lounge complete with tea & coffee facilities for your comfort. McAully Smash Repairs prides itself on their very high standard of customer service. It is for this reason that we can assure you that our staff will always work professionally and efficiently with you in attending to your requirements through what can present for some as a difficult and inconvenient time. The McAully Group Motto: Focused on …… Delivering Traditional Quality Through Innovative Technology is upheld by all our staff and you will easily recognise this through your dealings with us. 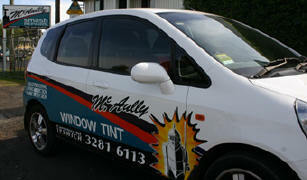 We also operate a highly efficient Window Tinting division, “McAully Window Tint and Automotive Protection”. The benefits of protecting your vehicle, and its occupants, from the harsh Queensland sun’s harmful UV rays is both a practical and wise investment. Our Window Tint Division is also proficient in the quoting and application of tint to homes and other types of buildings. Again we use only the finest quality products in this division and all our work is guaranteed and comes with a manufacturer’s warranty. The Automotive Protection includes; electronic rust proofing, interior fabric and trim protective treatments and paint protection treatments. We are also pleased to offer you another cutting edge technology, DataDot, as part of our commitment to being at the forefront of our industry with innovative technologies. DataDot www.datadotdna.com/au/ is a high-tech identification technology that is so small that they are only the size of a grain of sand. These minuscule dots are specifically manufactured to include all the identifiable details of your asset, be it a car, bike, boat etc and are applied en masse over all parts of your asset and are undetectable by the human eye alone. They are produced using a unique formula that allows the relevant authorities to easily detect their presence and determine the true identity of the asset. The enviable protection it provides for your assets is supported by many OEM as they now include it as an integral part of their product’s manufacturing process. These OEMs include; Porsche, Subaru, BMW, HSV & FPV just to name a few. The DataDot technology is so effective in both prevention and recovery that it can be applied to anything whether it be at work or at home. See how DataDot can make your property too hot for thieves! Contact our offices for an affordable and competitive quote for any of the above services and enquire about any individually tailored packages we can provide for you.